Airport Madness: Time Machine is progressing nicely. If things seem quiet around the website lately, it’s because we are hard at work on our current project. I’ve promised you all that this game will be ready by May. Wow, I sure am good at setting challenging goals for myself, aren’t I? May should be do-able. I’m sticking with May. So far I’ve bragged about all of the stuff I am ripping out of Airport Madness in this version, such as radar and pilot voices, but I haven’t elaborated much on what’s getting added. The coolest part of AMTM definitely has to be the story, which is based on the history of aviation with a few twists. 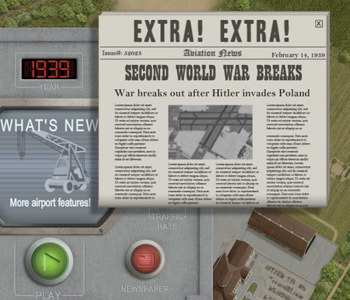 Each level begins with a popup, introducing the current year, what’s new, as well as a newspaper that describes the real-life aviation events that took place in that year. As much as I love this newspaper feature, it’s taken a bite out of my time and pushed back the launch date by more than a week. This is the story of my game development career. I come up with an idea that a few folks will look at and say, “Hey, neat”, then I spend an inappropriate amount of time creating it. My new motto should be, “If it’s not adding fun, don’t do it”. Oh, well. I will learn for next time. What number are we at now, Airport Madness 5? The heaviest workload has been endured mainly by our artist, who has had the task of managing the growth of an airport against aviation history’s timeline. You see, we add new detail to the airport in 6-month increments. So from 1925 to 1970, the airport evolves with nearly 100 small expansions. In 1930, for example, we build a beautiful passenger terminal, only to bulldoze it seven years later for a bigger one. And in 1933, our beautiful farm with it’s red barn gets bulldozed to make way for airport expansion. A new terminal gets built, which takes nearly three years to complete. After construction is complete, WWII breaks out and this area becomes a military base. Another challenge is real estate. What starts out as a small piece of farmland becomes a busy airfield. As this field expands, we begin to run out of screen space. When this happens, we do a zoom-out, which enables us to show you more detail. 1934 is when we first start to run out of room, so we shrink the details to fit. The next zoom-out happens in 1955. As the background detail gets shrunken to fit the screen, so must the airplanes shrink, to fit the smaller appearance of runways, taxiways and parking spots. As usual, I’m running fashionably late with my latest game. Look for it here next month, and if you haven’t already signed up for our newsletter, be sure to do so, and stay informed of Airport Madness: Time Machine’s release. This entry was posted in Airport Madness 5, Airport Madness: Time Machine on April 18, 2013 by admin.